Paul Auster and Prime Minister Erdogan stirred a controversy after Auster gave an interview to Hurriyet in late January in which the Jewish-American author said he would not visit Turkey due to the number of imprisoned writers. Prime Minister Erdogan fired back at his party's parliamentary group meeting a few days later, calling Auster "ignorant" and hypocritical for visiting Israel, which the author visited in 2010. The spar between the two men only ratcheted up when Auster issued a response in the New York Times in which the prominent author reiterated his concerns about press freedom in Turkey. 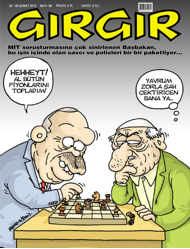 CHP opposition leader Kemal Kilicdaroglu soon jumped into the fray, inviting Auster to come to Turkey at his invitation, after which another back-and-forth ensued in which Erdogan said Kilicdaroglu and Auster should "go for a picnic together" atop a hill in Israel overlooking Gaza. Just why these remarks triggered such a firestorm is something of a mystery to outsiders of Turkey (I have had four people ask me this in the past two days), but it has a lot to do with the sensitivity of the prime minister and the political opportunism involved on all sides. After all, this is politics. If Erdogan had simply let the author's comments go by the wayside when first they were issued, this would be a non-story. Yet Erdogan decided to attack Auster, not only contradicting his claim writers were being imprisoned in Turkey for expressing their views (according to Erdogan's public statements, these writes are "terrorists," people who plotted to overthrow the government or who supported the PKK), but linked Auster to the Palestinian-Israeli conflict, a move sure to win him popular support among the party's base. As far as I can tell, Auster has been largely ambivalent on the issue of Israel's occupation of the Palestinian territories, but at the same time, Erdogan's ad hominem attack on Auster is more deflection than reasoned response, and in turn, Kilicdaroglu's backing of Auster an attempt to put raise the profile of the continued attacks on press freedom in Turkey, and of course, win political points in so doing. To me, what is significant here is that Auster's comments, whose Jewish ancestry and shakiness on the issue of occupation make for an easy target, were so singled out by prime minister. Erdogan's remarks, while not necessarily anti-Semitic, show the familiar lack of control for which the prime minister has often been criticized by friends and enemies alike. Most interesting here is how Erdogan and others in the AKP, as well as AKP-friendly public opinion leaders, were quick to label Auster as either a victim or perpetrator of a massive smear campaign designed to discredit the party. Sabah columnist Nazli Ilacak portrays Auster as seriously misinformed, but places the blame on an organized psychological campaign being carried out against the AKP-led government. Is the misinformation that made its way to Auster the product of Ergenekon? Is this the kind of black-ops for which former General Chief of Staff Ilker Basbug is currently imprisoned? According to AKP Vice President Bulent Gedikli, the answer is yes. In a statement made yesterday, Gedikli said, "Paul Auster is part of the plot." "What plot?" I might ask, but many in the AKP, including a number of their supporters, would dismiss me as a fool -- and do so quite sincerely. The narrative of many in and supportive of the AKP is defined by victimage, of shadowy forces conspiring to keep them at the bottom ranks of society and far removed from political power even when every indication of the Turkey that exists after nearly ten years of AKP rule is that the reality could be further from the truth. Unfortunately, this narrative is largely a by-product of real policies in over 80 years of Turkish history that were designed to do just this -- most significant among them, at least in terms of the historical memory of those currently in power, the Feb. 28 process that brought down the elected Refah party government in 1997 and the policies to follow that were designed to, though not so successfully, to keep political Islam in its place and guard against the rise of a pious majority. The narrative is one of oppression, and democracy, for many, therefore understood solely in terms of allowing for the majority, long downtrodden, to finally take the reigns of power. For those who imagine plots at every corner and shadowy networks bent on destruction, democracy is about liberation, but it is not necessarily liberal. What the recent Auster imbroglio reveals is that these myths are not gone from historical memory, and despite ten years of dominant party politics, will likely not be gone anytime soon. Also revealed is that playing on these anxieties, especially if the opponent is as easy a target as Auster, can garner a good bit of political capital. At the end of the day, Erdogan likely emerged stronger and the victim mentality ever more entrenched while few will remember who Paul Auster is in a few months time. The prime minister made waves last Wednesday when criticizing CHP Kemal Kilicdaroglu, who had, as he routinely does, accused the prime minister of religious populism. Erdogan, in response, said, "Do you expect the conservative democrat AK Party to raise atheist generations? This may be your business and objective but not ours. We will raise a generation that is conservative and democratic and embraces the values and historical principles of its nation?" The remarks have caused a firestorm of controversy, most of it re-active, as the Turkish public waits for Erdogan to clarify his remarks. Though the AKP has always publicly affirmed its commitment to secularism, most notably of late in the prime minister's address in Cairo last September, doubts still linger as to whether the party is simply waiting to show its true face. Yet this does not really capture the picture. The issue now is not so much whether Turkey could give way to the religious fanaticism of Iran, which was always an overblown assessment, but whether religious minorities and nonbelievers can be secure in their rights as minorities amidst a largely Sunni, and fairly conservative, religious population. The tension between the two rises to the surface as much in private space as public, in particular when it comes to neighborhoods where the more and less religious are now residing next to each other and walking the same streets. The real concern with Erdogan's remarks is to just what role he envisions the state to play in the religious arena. AKP officials are well-known for espousing their support for the American interpretation of secularism over the French, which is entirely different, but as I have written before (see past posts), these same officials often do not have a very good understanding of the American system nor is it free from excesses and more than the occasional encroachment of religion into public policy making whereby minorities -- religious, sexual, and otherwise -- routinely face discrimination thanks to legislation seeking to promote values. Turkey, though not by any means more liberal than the United States, has to some degree been protected from such excesses thanks to the state's understanding of secularism, which, despite a horrible history of discrimination against what likely is a religious majority (for example, the headscarf ban), has explained why many of Turkey's minorities, in particular Alevis and Jews, are quite nervous about the state of secularism in Turkey (whether they would characterize it as "deterioration," "decline," or "renegotiation"). I know this last sentence has a lot of clauses, but is revealing of the degree of careful qualification and nuance the issue requires. What is disturbing about Erdogan's recent remarks is precisely their lack of nuance. Even more disturbing is that after making the remarks, Erdogan did simply clarify his remarks and put the matter to bed. First, seemingly attempting to re-frame his remarks by stating that "people can be both pious and modern," and only after stating that criticism of his remarks was the product of an ill-intentioned defamation campaign, the prime minister posed this set of twin rhetorical questions: "Do you want our youth to become thinner addicts? Do you want a new generation that has no moral values and no purpose?" Thinner addiction has become a major problem among youth in many of Turkey's large cities, which have experienced massive amounts of migration and where many still live in poverty. We, as the youth and academics of this country, of Muslim, Christian, Jewish, Zoroastrian, Alawite, Shafi'i, religious and nonreligious, atheist and agnostic backgrounds, all joined with a firm belief in secularism, find your recent remarks about raising a religious and conservative youth most alarming and dangerous. Perhaps no issue is more revealing of the struggle for liberal democracy in Turkey than the assassination of Turkish Armenian journalist Hrant Dink and the trial of members of a likely state-linked organization that gunned him down on Jan. 19, 2007. Almost five years to the date of what was a very calculated murder, the Istanbul court hearing the case of 19 defendants accused of participating in the conspiracy to slay Dink ruled on Jan. 17 that there was indeed no organization, no conspiracy. Instead, the court portrayed the assassination as a random act of violence carried out by two ultra-nationalist youths acting alone. The court did not even touch the issue of links between state officials and the organization that have been revealed in the five years following the assassination. For more on the verdict from Reporters Without Borders, click here. Dink presaged his murder, telling friends before his murder "that his heart was a 'timid pigeon' waiting for bad things to happen (see June 26, 2008 post). Dink had begun receiving threats from ultra-nationalists in 2004 following an article he wrote for the Turkish Armenian paper Agos, over which he presided as editor. In the article, Dink claimed that Sabiha Gokcen, Ataturk's much beloved adopted daughter, was an Armenian orphan. The article earned him the scorn of then Chief of General Staff Yasar Buyukanit, who denounced the article as a crime against national unity. Before 2006, Dink had been subject to numerous court cases because of his questioning of an ethno-national conception of Turkish identity and his writing on the 1915 massacre of tens of thousands of Armenians. Throughout his work, Dink tried to bridge divides between Turks, Armenians, and Turkish Armenians, challenging both Turkish and Armenian identity, polarizing approaches to the genocide issue, and the general recalcitrance of the two sides. He did this as only a Turkish Armenian could, and his thinking challenged fellow Turkish citizens and ethnic Armenians alike. Most of all, Dink represented the expression of difference -- not just being different, but expressing it, and doing so always as an individual guided by free thought and its commensurate dignities. His writing, and that he attracted so many fans, Turkish and Armenians, is a testament to where Turkey has come since its founding and the longing for liberalism shared by so many of its citizens. Yet not all were so content with Dink's ideas, his constant challenging of Turkish state and society. In 2004, Dink began receiving numerous death threats. The gravity of their danger to Dink's life prompted the deputy director of security in Istanbul to order police in Bakirkoy, where he lived, and Sisli, where he worked at Agos, to make provide for his protection. In February 2006, intelligence of the murder conspiracy to which he would soon fall victim made their way from police in Trabzon to Istanbul. The memo from security officials in Trabzon stated, and quite simply, that Yasin Hayal, a known ultra-nationalist in the Black Sea province, was going to kill Dink. Less than one year later, Hayal, acting alongside 17-year-old gunman Ogun Samast, gunned down Dink outside Agos's offices. Yet it seems the memo, ranked "low priority" by Trabzon police chief Ramazan Akyurek, was not paid much attention, if any, by Istanbul police, and little action was taken by either authority nor the gendarme in Trabzon, who were also watching the conspirators, to halt the assassination. Akyurek has since been promoted to head the Board of Inspectors in the General Directorate for Security. Dink knew his death was coming, and so did members of the Istanbul and Trabzon police, as well as the Trabzon gendarme. Meanwhile, Nedim Sener, one of the journalists who took the Dink investigation seriously and documented what the police knew before the murder, has been jailed on charges of being linked to the Ergenekon terrorist organization. To offer further damning evidence of the neglect -- and quite possibly, involvement -- of elements within the Turkish security forces, one of Dink's assassins, young trigger-man Ogun Samast, posed with police officers in Samsun behind a Turkish flag just two days after the murder. While government officials have complimented themselves on apprehending Samast and other conspirators soon after the murder, adequate explanations for this photograph and the events before the murder have yet to come to the forefront, and according to many of Dink's supporters, have indeed been subject to a massive cover-up in which the state is complicit. Where Does the Government Fit In? Indeed, the more than four-year trial of Dink's conspirators has been hindered from the beginning due to an inability, and perhaps unwillingness, to procure evidence from state security offices, as well as government agencies such as the Telecommunications Board (TIB), which only last December turned over evidence documenting phone conversations and text message exchanges between the conspirators. TIB, citing a 2007 provision by the Justice Ministry related to the use of phone records in criminal investigations, had refused to turn over evidence for more than four years following the murder. Video footage of the street on which Dink was shot was erased from cameras soon after the incident, another fact that has led to accusations against the police ranging from neglect to complicity. As Hurriyet columnist Sedat Ergin points out, efforts, or lack thereof, to hold state officials to account for their role in the murder have given way to serious misgivings on the part of the Turkish public. In 2008, and administrative court acquitted police of neglect while failing to really delve into the events in the days and months before the murder, and in 2009, another effort to investigate the role of security officials was blocked by the Interior Ministry, which at the time and just as today, was controlled by the ruling Justice and Development Party (AKP). The gendarme is the only state organ wherein an official has been found responsible for neglecting to prevent Dink's murder. Though AKP government officials are always careful to point to the independence and integrity of judicial processes, the fact that the government now has firmer control of the judiciary has caused many critics, both of the government and the investigation into Dink's murder, to point their finger at the government. When the Dink investigation started in 2007, the government did not have the control over judicial organs, such as the Supreme Board of Judges and Prosecutors (HSYK), that it currently wields. (Click here for a bit of insight as to how the AKP has gained more control through amending the constitution to give its elected representatives the ability to appoint members to this body and Turkey's high courts. See also this past post.) The HSYK is currently investigating the presiding judge in the case, Rustem Eryilmaz, as well as prosecutor Hikmet Usta, though on grounds that the two inappropriately spoke out publicly after the verdict rather than that they mishandled the case. Nobody is blaming the government for not interfering with the judiciary; its guilt is in not intervening with the police, with the intelligence organization and in not demonstrating the necessary attention to bring out the truth. In Turkey, judges and prosecutors are not as strong and independent as, for example, in the United States, the United Kingdom or Italy. While in the West the prosecutor commands the police, in Turkey the police command the prosecutor. This is the truth in practical terms, especially in politically sensitive cases. The judges are also bound to prosecute whatever is in the indictments presented to them. The government does not command the courts and prosecutors. But it does command the security forces. For this reason, it has its share of responsibility in the verdict the court has ruled. It could have put pressure on the police to provide that a more comprehensive and a stronger file be handed over to the prosecutor. It did not. The government is still boasting about catching the murderer in 32 hours. This is not a matter to be proud of; it a matter to be ashamed of. Who was going to kill Dink and when it was going to happen were known by security forces days before the murder. If the incident was stopped at that time and the murder was prevented, then yes, it could have been a matter of which to boast. But it is not hugely ingenious to identify the assassin and then catch the killer. This is what the government has to explain: Why isn’t the entire organization, the one for which the killer acted as a hit man, foiled and punished even if it is five years that have passed since the murder? What is the reason for the systematic reluctance on this matter? Mustafa Akyol, generally more sympathetic of the AKP, explains that this reluctance might be driven by the fact that many of the bureaucrats and police who neglected to properly investigate Dink's murder (and, my words, not his, but perhaps even cover up critical aspects of the killing) are now aligned with the AKP and have been appointed to key positions within the government. These include not only Akyurek, but also former Istanbul police chief Celalettin Cerrah, headed the Istanbul police at the time of Dink's murder. The government has never allowed Cerrah to be questioned in relation to the case, and in 2009, he was appointed a provincial governorship in Osmaniye. Similarly, the failure of the AKP to put pressure on TIB and the obstructive role of the Interior Ministry throughout the investigation give great cause for concern. Soon after the verdict, Dink family lawyer Fethiye Cetin declared that the effort to unveil the truth behind Dink's murder had only just begun, and it is quite possible this is the case. An indignant Cetin has already appealed to the Supreme Court, which will likely render a decision in one year's time. Hikmet Usta, the Istanbul prosecutor charged with the case, has also made an appeal, joining Cetin in denouncing the court's inability to find evidence that the crime was the premeditated work of a criminal organization as a complete oversight of the facts presented.